Stay with me. This analogy is going to work. While watching The Marvelous Mrs. Maisel, I kept thinking about The Newsroom, Aaron Sorkin’s short-lived HBO drama. The two series have nothing in common, but with The Newsroom, I felt as if everything that had worked for Sorkin on The West Wing had backfired on him. The same conundrum happens to Sherman-Palladino here. Midge Maisel (Rachel Brosnahan) is a 26-year-old Bryn Mawr graduate who thinks she has it all. She’s married to Joel (Michael Zegen), has two children, and lives in a beautiful apartment on the Upper West Side in the same building she grew up in. She’s the kind of woman who likes her college roommate fat because “I’ll have someone to eat with who won’t steal my boyfriend.” (Yes, unfortunately, that much-criticized joke from the show’s opening moments is still there). She measures her ankles, thighs, waist and bust on a weekly basis to make sure she stays in perfect proportion and never lets her husband see her without her make-up on. The divorcees in her social circle are outcasts. Midge’s world comes crashing down when Joel leaves her for his secretary (the women who make a career by knowing shorthand are much mocked) and she inadvertently turns that pain into a comedy routine. Susie (Alex Borstein), a comedy club employee, thinks Midge could be the next big thing. Unlike her husband, who steals Bob Newhart’s material, Midge has a natural, raw ability to find the humor in her life. Susie sees this and is also bemused by Midge. “You’re like a super-coiffed science experiment,” she tells her. It’s a recurring “joke” on the show that people mistake Susie for a man. I put joke in quotes because it’s not actually funny. The show leans so hard into Jewish stereotypes it almost topples over. Midge’s mother, Rose (Marin Hinkle), worries that her granddaughter’s forehead is too big, and tells the neighbors that Joel got a big promotion and that’s why he’s not around. Midge’s father, Abe (Tony Shaloub), thinks his daughter just needs to put on a pretty dress and get her husband back. Brosnahan is terrific, but I spent a lot of time wondering if I liked Midge. You definitely don’t have to like a TV protagonist, and I definitely support TV that bucks the notion that female characters, in particular, are supposed to be likeable. But the difference here is that we are supposed to like Midge. The show finds her to be utterly delightful. But Midge’s self-centeredness is tough to take. It was also a mistake to give her character two children. It fits the story line that Midge did everything right, including giving her husband a boy and a girl but the show didn’t think through what to do with the children. It’s the Mad Men era, so it’s definitely the time for children to be seen and not heard, but it’s odd that Midge just plain seems to forget about them for days on end. In the third episode available for review, Midge wonders about her choices. “What if I’m not supposed to be a mother?” she ponders. Maisel leaves that idea there and doesn’t do anything with it. The children are an accessory Midge thought she wanted but now wants to return and can’t. I could take Betty Draper’s indifference to her children. It doesn’t fit with the character the show thinks Midge is. The show looks gorgeous, full of lush, vibrant colors. The costumes are phenomenal. I had extreme coat envy while watching. The acting is top-notch. 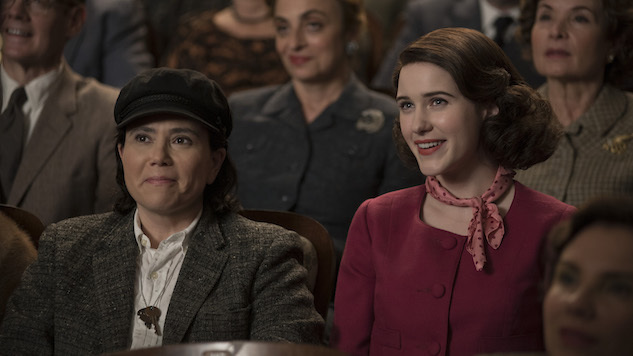 But The Marvelous Mrs. Maisel will leave viewers cold. The Marvelous Mrs. Maisel premieres Wednesday, Nov. 29 on Amazon Prime.